Culver City Public Theatre returns to Carlson Park this summer with its 18th season of free performances. The all-volunteer company is many children’s first experience with live theatre, establishing an appreciation for the arts that stays with them throughout their growth. It also brings people of all ages and budgets together to experience and enjoy live theatre in a beautiful outdoor setting. This year, Carlson Park will become the Forest of Arden, the backdrop for Shakespeare’s pastoral comedy, As You Like It, directed by Benjamin Rathbun. The season runs for six weekends, July 16 – August 21, with all performances beginning at 2pm. At noon, the company presents a one-hour play for children; this year an original written by CCPT member Eric Billitzer entitled Frog Tails. Parking is free (with a special note to park on the park side, not the residential side). Seating is on the grass, first come first served. You can bring blankets or lawn chairs and the park is wheelchair-friendly. These community performances are supported in part by a Culver City Performing Arts Grant with support from Sony Pictures Entertainment, and by the Los Angeles County Board of Supervisors through the Los Angeles County Arts Commission. 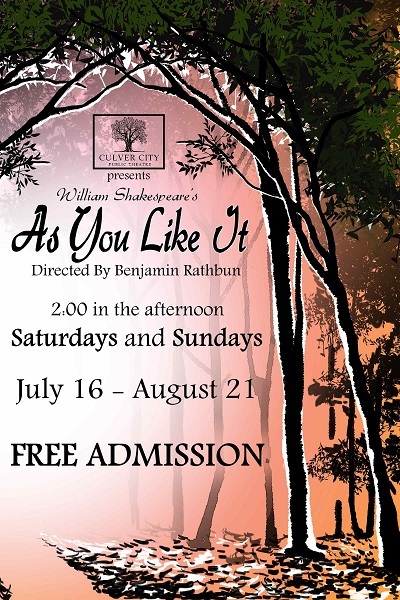 If you’re an actor and would like to audition for CCPT’s production of As You Like It, prepare a 1-2 minute Shakespearean or classical monologue and bring a headshot & resume to their auditions tomorrow, May 21 (11am-2pm) or Wednesday, May 25 (7-10 pm). Location: Veterans Memorial Complex , 4117 Overland Ave, (at Culver Blvd.) Follow the signs to basement Rooms 2 & 3. More info on their Facebook page HERE. Culver City Public Theatre is also looking for a stage manager and costumer for As You Like. There are stipends available for both positions. For more information, contact Laura Boccaletti at info@ccpt.org. And for more about the company, visit www.ccpt.org. Hello. I’m trying to send a play about Culver City but the address that was posted isn’t working. Can you give me another address? Thank you. Shirley, do you mean the address in the article? If so, that is the only email they provided. If you mean for Shakespeare in LA, the email is in the “About” section of the site. Thank you.